Although several members were off with Easter Vacation planes, Word Weavers had a memorable and fun evening last night. In addition to the members present, my oldest daughter Anna was also there, so I was little proud to share the Toastmasters and Word Weavers experience with her. We had speeches from Ingo and myself. Ingo did project #5 from the “Speaking to Inform” manual. His speech was called “Lifetime options” and in it he wove a path through the journey of his life. He seemed to be speaking directly to my daughter when he said that you should take as many of the opportunities that you have in life because you never know where you’ll be able to use them. He started the speech describing the image of how when you’re young, all the career possibilities are like bubbles in the air, there are so many of them and they seem to be everywhere. I could see Anna and myself chasing after bubbles and watching them burst as we touch them and all the time wondering what bubbles will really pan out. Thank you Ingo for sharing this with us. I also did project #5 from the “Speaking to Inform” manual. My speech title was “7 Billion People”. In it I shared my concerns about how our planet can continue to support our exploding population. I told the audience about how Annie Leonard spent over two decades becoming an expert on trash and shared some information about the Material Economy from “The Story of Stuff”. I also mentioned the Robert Kennedy quote about GDP not being a good measurement of society. I told the audience about the “Steady State Economy” and encouraged everyone to look into both of these so that we don’t cross the point of no return and can ensure a good future for our kids, grandchildren, and future generations. Bryan and Martin were the Evaluators and both of them provided some valuable tips that the speakers can. 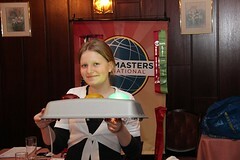 Anna was our timer and she really did a great job and had a lot of fun. I was the Toastmaster of the Evening. Next week we’re going to have an Open House with Rhetorik of Wiesbaden, there have been a lot of guests invited, so it would be good if we can have as many members as possible attend so that we can answer questions of the guests and show them what a fun group we are. In addition to our regular meeting on May 14th, we also have our annual BBQ on May 21st, so we have some fun events on the horizon.